Sen. Bernie Sanders (I-Vt.) has introduced substantive single-payer legislation in the U.S. Senate. 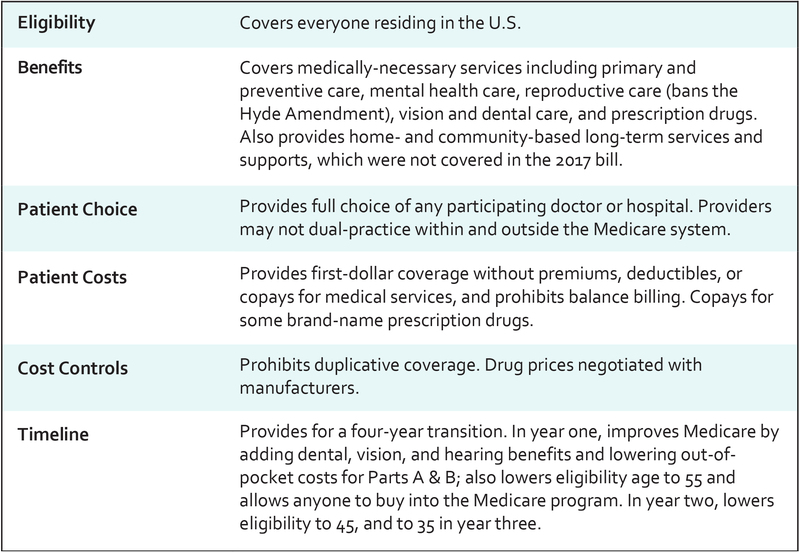 The Medicare For All Act (S.1129), which was filed April 10, 2019, would establish a universal single-payer health program to ensure care for all residents of the United States. Based on our analysis, we find the Medicare For All Act of 2019 to be a significant step forward in the fight for single payer. Taken together with Rep. Pramila Jayapal’s Medicare for All Act (H.R. 1384), it would transform the U.S. health care system, making health care a human right. How can the bill be improved? Fund hospitals through global budgets, with separate funding for capital projects: A “global budget” is a lump sum paid to hospitals and similar institutions to cover operating expenses, eliminating wasteful per-patient billing. Global budgets could not be used for capital projects like expansion or modernization (which would be funded separately), advertising, profit, or bonuses. Global budgeting minimizes hospitals’ incentives to avoid (or seek out) particular patients or services, inflate volumes, or upcode. Funding capital projects separately, in turn, allows us to ensure that new hospitals and facilities are built where they are needed—not simply where profits are highest. They also allow us to control long term cost growth. End “value-based” payment systems and other pay-for-performance schemes: This bill continues current flawed Medicare payment methods, including alternative payment models (including Accountable Care Organizations) established under the ACA, and the Medicare Access and CHIP Reauthorization Act of 2015 (MACRA). Studies show these payment programs fail to improve quality or reduce costs, while penalizing hospitals and doctors that care for the poorest and sickest patients. Establish a national long-term care program: This bill includes home- and community-based long-term services and supports, a laudable improvement from the 2017 bill. However, institutional long-term care coverage for seniors and people with disabilities will continue to be covered under state-based Medicaid plans, complete with a maintenance of effort provision. PNHP recommends that Sen. Sanders include institutional long-term care in the national Medicare program, as it is in Rep. Pramila Jayapal’s single-payer bill, H.R. 1384. Ban investor-owned health facilities: For-profit health care facilities and agencies provide lower-quality care at higher costs than nonprofits, resulting in worse outcomes and higher costs compared to not-for-profit providers. Medicare for All should provide a path for the orderly conversion of investor-owned, for-profit health-care providers to not-for-profit status. Fully cover all medications, without copayment: Sen. Sanders’ bill excludes cost-sharing for health care services. However, it does require small patient copays (up to $200 annually) on certain non-preventive prescription drugs. Research shows that copays of any kind discourage patients from seeking needed medical care, increasing sickness and long-term costs. Experience in other nations prove that they are not needed for cost control. See below for a list of current Medicare For All Act co-sponsors. It is important to build as much support for single payer as possible, and you can help! If your senators have already co-sponsored the Medicare For All Act, call and email to thank them. Also, ask them to help improve the bill by covering institutional long-term care, establishing global budgets for hospitals, ending pay-for-performance schemes, banning investor-owned health facilities, and fully eliminating copayments. If your senators have not cosponsored the Medicare For All Act, call and email to encourage them to co-sponsor. If you believe one or both of your senators may be skeptical, visit pnhp.org/gop to brush up on the conservative case for single payer. To find your senators by state, click here. If you have trouble locating contact information for your senators, you can always call the U.S. Capitol switchboard at (202) 224-3121. Sen. Sanders was joined by several co-sponsors, leaders from National Nurses United and the American Medical Student Association, and other health justice advocates to introduce the bill on April 10, 2019. PNHP live-tweeted the press conference (be sure to follow us @PNHP).